Such a big difference 2 years is making, I swear! 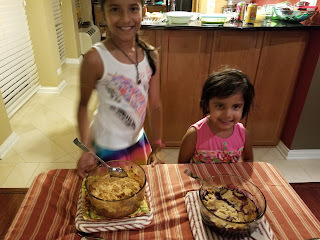 This was us 2 summers ago baking a crumble and fast forward to now.... the girls 9 and 4 are making the pie/ crumble now pretty much on their own and the cherry on top.... they are also cleaning up after! So here is the Pie/crumble recipe, kids edition! The girls made two crumble's this past weekend, so except the fruits being different, both of them followed the recipe step by step identical to each other! For baking or cooking with kids the best thing I have learned over the years is keep all ingredients, measuring spoons out on the counter and then walk the kids through the process step by step. 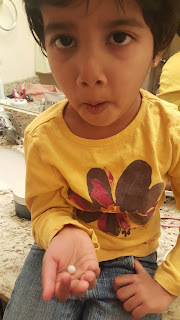 Make them wash their hands, before, during and after! 1. In a ready to bake Pyrex dish mix all the ingredients of the fruit base. 4. Layer the crumble topping on top of the fruit base. Note: The little one definitely needed help with this steps since her natural instinct was to press the 'dough'. I learned that telling them 'Layer the topping like a blanket on the fruits' worked like a charm! 5. Bake the crumble at 375 F for 20-25 minutes, you could brush the topping with additional butter to make it 'brown' better. Note: I am paranoid about the oven, so this step I led completely. While the pie/crumble is getting baked... have the kids clean up. Both girls washed their hands off after they licked their fingers with the delicious dough topping. Again the kitchen clean up was a simple one... the older one helped in putting all the ingredients from where they came and the little one helped with wiping the counters and the floor. So go on... let the kids lead a little and you will learn a lot! Home Made Paneer, Yes Please!